CD review: "Too Much Fun"
This review first appeared in the April, 14, 1995 issue of the North County Blade-Citizen (now North County Times). You would think C.J. 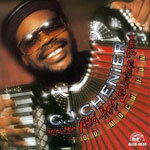 Chenier would have to be crazy to choose to play zydeco. It was his late father, Clifton, who was the public face of zydeco, the best-known of the handful of Louisiana French-speaking African-American musicians who married blues and Creole rhythms to Cajun forms in the years immediately after World War II. But where the scions of other musical royal families have faltered, C.J. has picked up his father's scepter and carried it forward with style and verve. He kept his dad's old band together after Clifton died eight years go (and guitarist Harry Hypolite still remains from the original Red Hot Louisiana Band), but he livened up the book some. "Too Much Fun" is C.J. 's fourth album since his father's death, and it shows him continuing to bring zydeco fully into the present. While the lilting accordion lines are still there, his father's traditional blues influences have been updated by a more modern R&B backbeat that gives the music an even more propulsive swing. C.J. reportedly didn't pick up an accordion until shortly before his father's passing, but he's developed into a fine player and is superior as a singer. His songwriting and choice of covers are both tasteful. Hard to beat this combination of top-notch musicianship and stellar material.